Skippool is the area around the River Wyre roundabout on the A585 – the main road between the coast and motorway network. 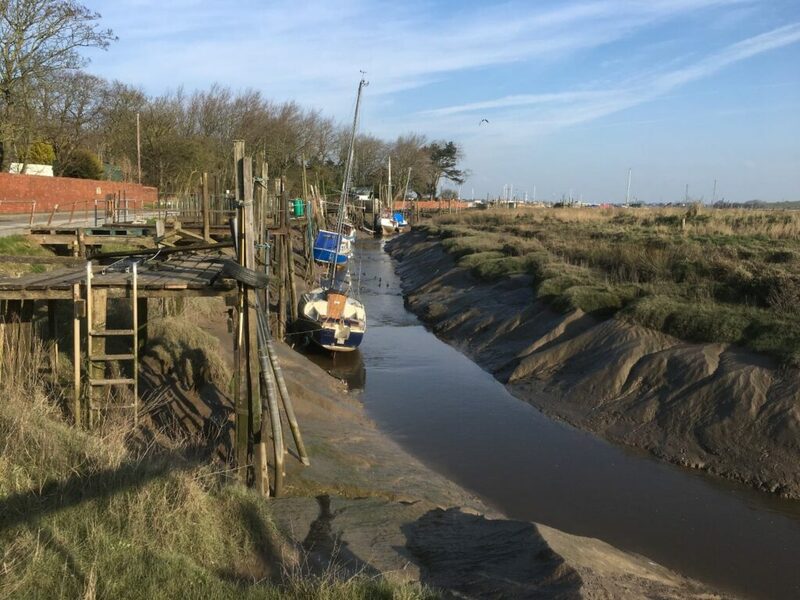 Skippool Creek is a fascinating place where small fishing boats are moored on the muddy tributaries which lead into the nearby River Wyre. In the distance, across the floodplain, you can see the River Wyre and Shard Bridge. As you might imagine it’s a haven for wildlife, and the air is usually alive with the sound of birdsong. 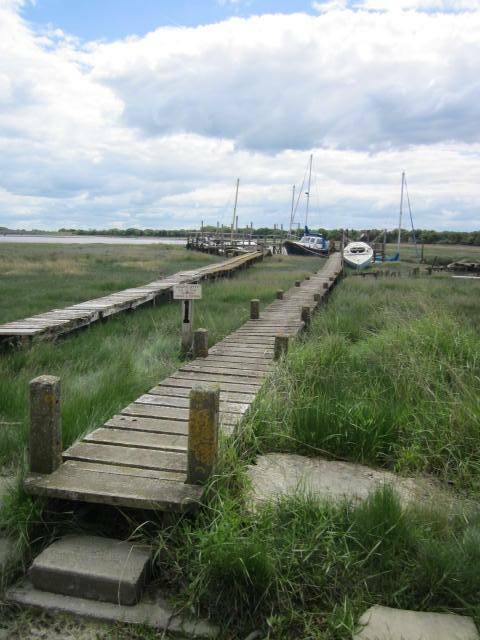 The tidal tributaries provide a rich source of food for the wildlife which lives there or visits. 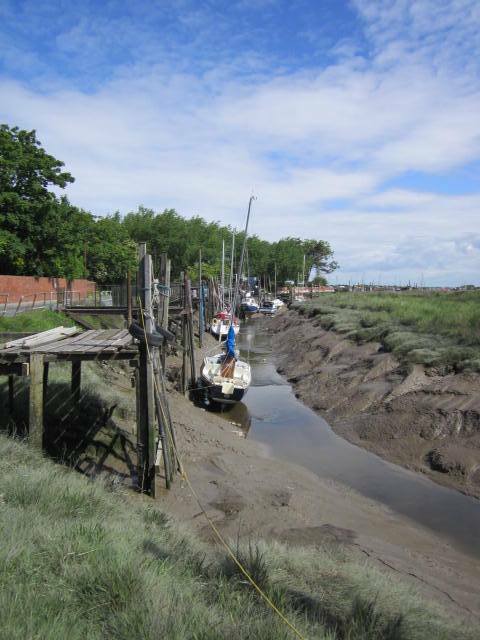 The mud flats, which you can see at low tide in the photo below, are an excellent source of food for birds. 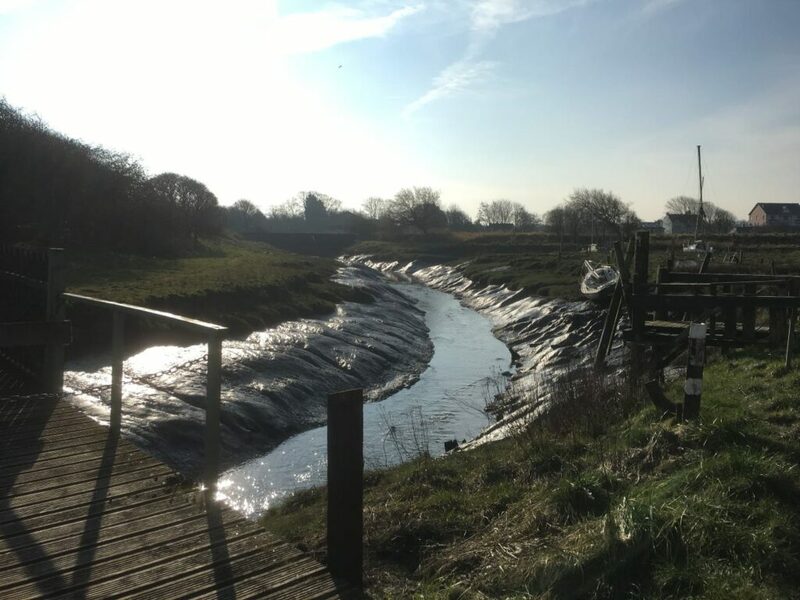 Mud flats at Skippool Creek, on the River Wyre at Thornton Cleveleys. See the A585 in the distance. 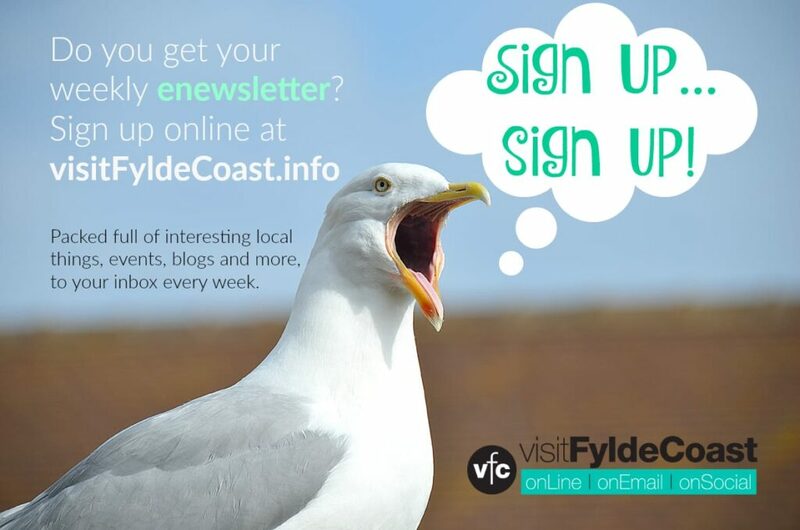 The nearest postcode for SatNav to Skippool Creek is FY5 5LF – which is Wyre Road. 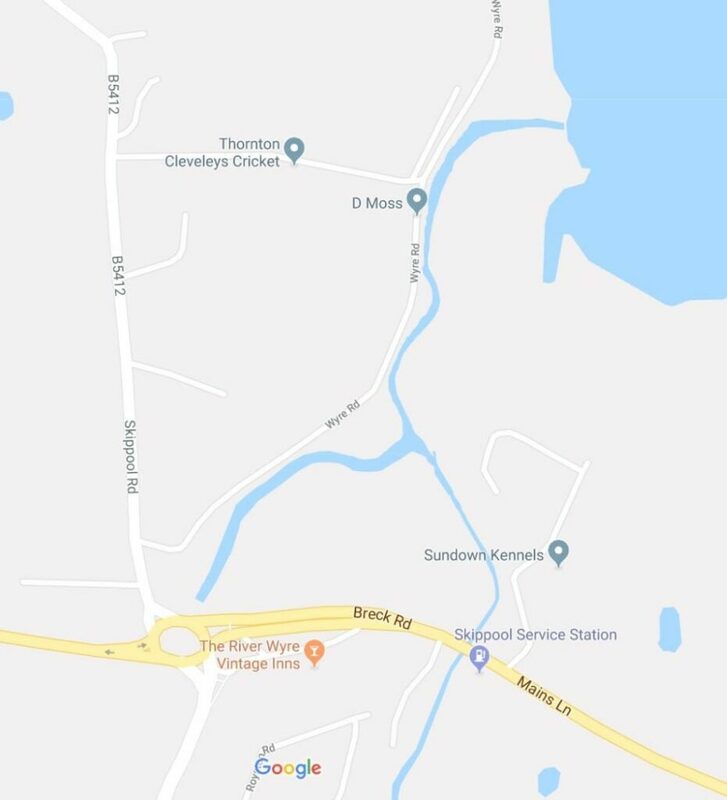 Turn off the A585 at the River Wyre pub at Skippool Road, and head as if to Thornton. Not very many yards along the road, turn right onto Wyre Road, before you reach the Thornton Lodge pub. Be careful, it’s very narrow at the beginning. Wyre Road follows the creeks and widens out slightly. There is a car park a little further along where you can leave your car to explore on foot. 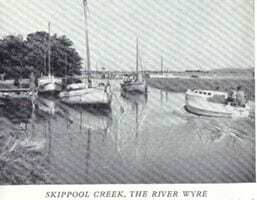 For hundreds of years Skippool Creek was a major trading port, along with Wardleys Creek at the other side of the River Wyre. It was in constant use from the end of the Medieval period. In 1837 it was described as ‘The Metropolis of the Fylde’. Goods arrived here from all around the world, from as far away as Russia and North America. Flax was imported from Ireland and the Baltic, timber came from across the Atlantic, and tallow from Russia. Records from 1806–08 show that limestone and oats were imported from Ulverston and coal from Preston. Then Cheese was exported back to the same places. By the 18th century, markets were held regularly in nearby Poulton. Carry on reading about the history of Poulton here. 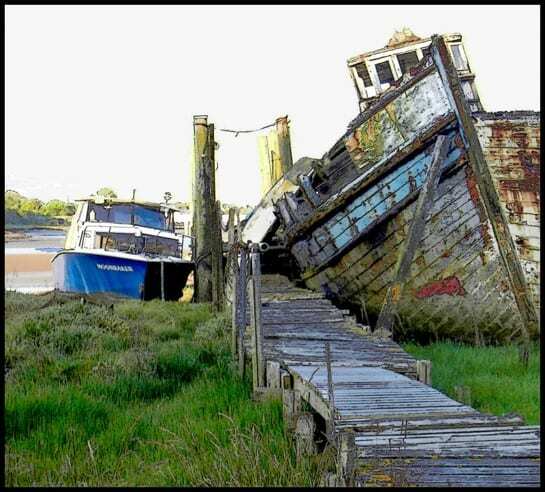 There are tales of smuggling and skullduggery in these creeks, which you can just imagine when you see them! 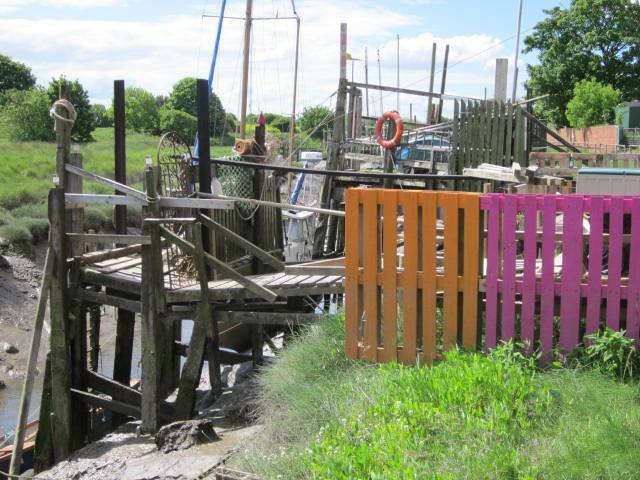 Nowadays, the mud berths which are accessed by wooden walkways, are used as moorings for small pleasure boats. 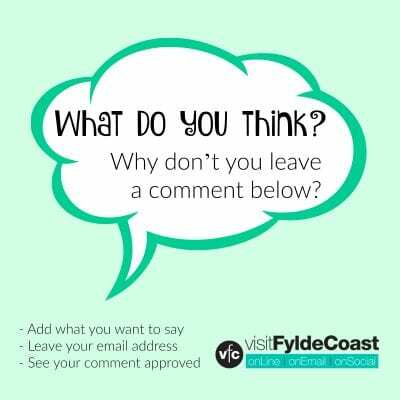 Thornton Cleveleys Past Facebook Group is the best place to find out the detailed local history of the area. Was there a pub called the Throstle’s Nest at Skippool? I don’t know of a pub called the Throstle’s Nest. Directories list a few pub names at Skippool. In 1824 James Bickerstaff was the licensee of the “Crackers Head”. Ten years later he is said to be at the White Horse and the 1839 Tithe map shows a field near the present River Wyre Hotel as the White Horse Bowling Green. By 1866 it was the Brockholes Arms with Robert Lee as licensee. 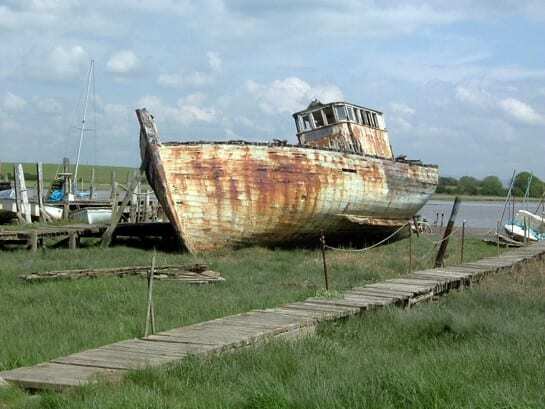 RECOLLECTIONS OF BLACKPOOL AND THE FYLDE – A Ramble by the River Wyre [extracts]. Early last March I walked with a young friend … My friend admired the quaint appearance of two thatched cottages on the right hand side of the road after passing Skippool bridge. The first is known as “Throstle Nest”, home of Edward Blackburn and family [In 1881 a Railway Porter in Thornton]. The other has been known from time immemorial as “Ouzle* Inn”. There is no reason to doubt that when Skippool had its little shipping trade this was a veritable inn. If all tales about smuggling are true, the landlord would be able to supply his customers with something stronger than ale. 50 or 60 years ago smuggling was looked upon in a far different light than at the present time. Men of respectability and position thought it no harm to connive at it. A vicar in one of our Fylde parishes, well-known for miles around for telling his hearers to “do as he said and not as he did”, was ready at any time to give a helping hand in “landing of cargo”. Early in the present century the little cottage was used as a school, taught by a person named Peter Whiteside. *An Ouzel is a type of thrush. Within the last two or three years the roadside cottage once known as the “Ouzel Inn” has disappeared. It stood in a narrow lane near Skippool. In its palmist days the Ouzel Inn had the reputation of being the resort of the smugglers who flourished when George III was King. It is said that the inn was never exactly a licensed house, but carried on an illicit trade. Thread on Thornton Cleveleys Past here. Do you know anything more about the history of Skippool? 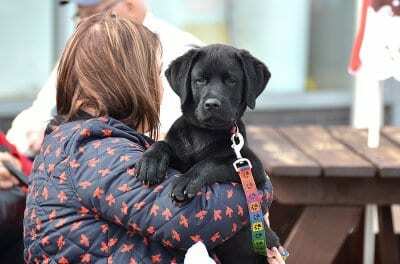 Have you got any photos? Add your photos and knowledge to this article by emailing jane@theRabbitPatch.co.uk. All contributors will be fully credited. I remember when I was very little they did the raft race from there.